Your elevator doors are perhaps the greatest advertising and branding opportunity you have. Unlike a billboard where potential customers zoom by, your audience stands patiently at the elevator waiting for them to open. While they wait, they stare at the elevator doors for an extended period of time. 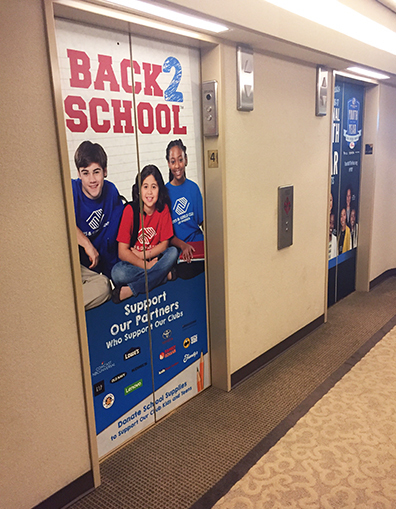 Why not take advantage of this time and brand your elevators with your custom graphics! From your door measurements, we expertly print photo quality graphics that are ready to install. 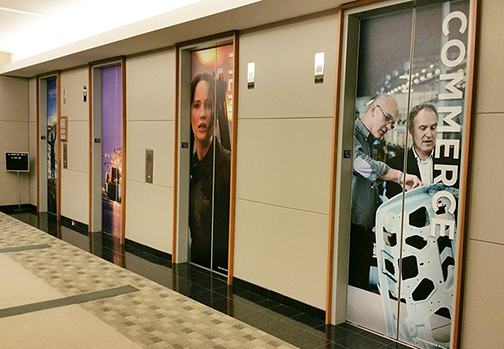 Our elevator graphics are printed with a material that can be removed from most surfaces. We also laminate all panels to add durability and to make cleaning even easier. We offer professional installation in the Atlanta area. We can also arrange for evening or weekend installation when elevators might not be in service. If you don't have a print ready file, our in house professional designers can help you create a compelling design. Complete our short contact form to request a custom quote or call us at 404.745.9595 and a graphics specialist will be happy to provide additional information or quote your project.